We enjoy our read-alouds and we especially enjoy books from YWAM Publishing. Our newest read was C.S. 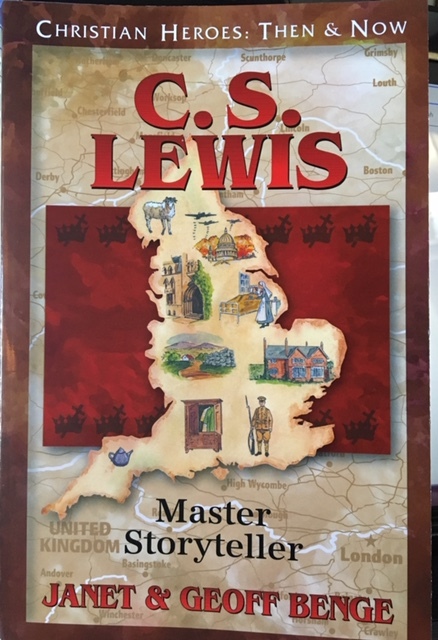 Lewis: Master Storyteller from the Christian Heroes: Then & Now series. I received this softcover book along with a link for the digital study guide. I just love the study guides that come with these books! The book has 192 pages and the study guide I printed out is 82 pages. This book is suggested for ages 10+ and I agree with that for reading on their own. Of course, this book is great for any age as a read-aloud. We just love these Christian biographies that include history and tell such wonderful stories. This story of C.S. Lewis interested even my 6-year-old kindergartner. 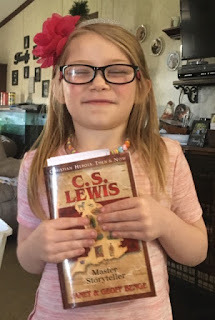 Both my kids love the Narnia series so this was a good book for us to review. It was nice to be able to learn more about the life of C.S. Lewis. My son and I knew a lot about his life already, but I had not ever learned about his earlier life and it was really nice to get the full picture of how is life evolved over time. Especially how he had started with Christian roots, walked away from it, and then became not only reacquainted with his faith but became a strong advocate for Christ and wrote such wonderful books that have no doubt helped to lead many to Christ over the years (and still do!). Clive's (Jack's) relationship with his brother Warren was so interesting to learn about. It allowed me to better understand how and why they had such a close relationship. Something else new that we learned was about his close friendship with "Paddy" and his devoted obligation to help take care of Paddy's family should something happen to him in the war. Learning about Jack's father losing so many close family members in such a short time was sad. I really l like the honor that was portrayed by Jack throughout the book prior to him losing his father despite the seeming coldness that his father treated him with over the years. There were many wonderful life lessons throughout the book that I enjoy my kids being exposed to and are great conversation starters in areas such as honor, perseverance, and hope. I had also forgotten that he knew J.R.R. Tolkien! That was pretty cool for my son since he loves both the Narnia series AND the Lord of the Rings series. Rich with history, two World Wars, his journey through Christianity, many wonderful books and his marriage to an American, Joy Gresham, this book has a lot to learn from. It is a definite must read in my book suggestions list. I think the most exciting part for me this time is that my kindergartner daughter is getting older and more mature in her studies. She just loves to learn and was so excited about this book! It tickled me and was sort of comical but I really enjoyed how much this seemed to inspire her and wants me to read more books like this (her AHA! moment where she is getting it as we generally read these types of books, LOL). I recommend you consider getting the digital study guide. It can be tricky to download (if you have trouble be sure to choose the option to expand ALL files) but once completed has a lot of options and ways to use it. We tend to just use the study guide as read aloud questions that we go over and discuss. I like to keep this low key since I want them to continue to love the reading part and learning. I don't want it to become a drudgery or something else they have to work on or study. I like that there are guides for Classroom & Homeschool and also for Small Group. There are so many suggestions and lots you can do with what is included in the study guide. You can use it to cover multiple subjects including geography since there are maps included. Scriptures are also included for additional Bible study. I can't say enough about these wonderful historical biographies and we wholeheartedly recommend C.S. Lewis: Master Storyteller, part of the Christian Heroes: Then & Now series. You can connect with YWAM Publishing on FACEBOOK, TWITTER, PINTEREST, and INSTAGRAM. You can check out Harriet Tubman and Milton Hershey, two other books from the Heroes of History series, that I reviewed in the past. Please also take the time to check out the reviews on others from this wonderful publisher by clicking on the graphic below.